Plants growing in an aquarium aren't typically lucky bamboo. While lucky bamboo is a water plant, it isn't necessarily the best choice for an aquarium plant. There is contradicting information about how this plant performs in an aquarium. At first glance, the pros for growing lucky bamboo in your aquarium are tempting. 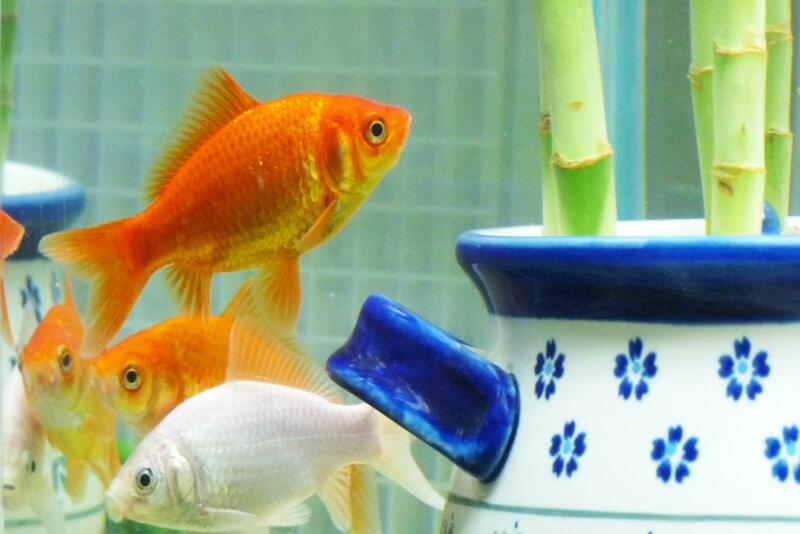 Lucky bamboo is a great filter for aquarium waste water. Its massive root system collects the fish waste matter and ammonia (urine) and strips it of all nutrients needed by the plants. One of the byproducts of aquarium fish urination is ammonia. Fish cannot survive in ammonia heavy water and the water has to be constantly diluted. Water plants are used in aquariums to remove the ammonia. Ammonia and nitrites which are nitrogen compounds are absorbed by aquarium plants. Lucky bamboo thrives on nitrogen and logically appears to be a good choice for filtering ammonia from an aquarium. One way that aquarium owners successfully grow lucky bamboo is to place it in the filter. This allows the root system to flourish underneath the water while the stalk and leaves survive above the water line. Some aquarium owners use small filter boxes attached to the tank sides with suction cups. This allows them to place several plants along the back of the aquarium. The controversy over growing lucky bamboo in your aquarium is based on the negative effects total plant submersion has on the lucky bamboo. Many aquarium owners claim they successfully grow lucky bamboo submerged in their aquariums. Lucky bamboo doesn't survive when completely submerged underwater. The practice of submerging lucky bamboo plants in aquariums will eventually result in the plant rotting, turning yellow and dying. While you may only submerge the roots and stalks, allowing the leaves to grow above the water, eventually the stalk will yellow and die. If you submerge the stalk and leaves, the leaves will be the first to die, turning yellow and black. The leaves will eventually fall off of the stalk into the tank. You'll need to remove the rotting leaves quickly to avoid setting up harmful bacteria in the tank. While the massive root system of a lucky bamboo plant may seem like a great solution to filtration, it can have a negative impact on your aquarium filtering system. The roots grow massive and could potentially become a nuisance. Lucky bamboo is a water plant and many people believe it will help to oxygenate the water by converting carbon dioxide into oxygen. The extra oxygen helps the fish to thrive. However, this process only occurs through the leaves. Unless you submerge the plant, this will not be a benefit to adding lucky bamboo to your aquarium. Some aquarium owners use various chemicals to maintain overall aquarium health. Depending on what is used, some lucky bamboo plants may be sensitive to these additives. All plants can be the carrier of fungus and bacteria and even diseases. You could unknowingly infect your aquarium with one or more of these threats. If your bamboo has any type of algae, this can be transferred to your aquarium, creating an unwanted algae battle. A bleach and water solution (2:20 ratio) could be used on the lucky bamboo, but such a disinfectant could harm the plant. While it may seem like the best of both worlds, combining a fish aquarium and lucky bamboo plant could have negative results if the plant rots and dies. This would create a very inauspicious effect, especially if the fish die as a result of a contaminate, such as fungus, algae or bacteria introduced by the addition of an infected lucky bamboo plant. There seem to be two schools of thought when it comes to growing lucky bamboo in an aquarium. There are advocates for using this plant and others who warn of unpleasant consequences. Lucky bamboo as an aquarium plant has risks that you need to evaluate prior to setting this plant in your aquarium.